The CENTURY 21® brand has the power to give you an edge locally, wherever your business calls home. With global brand awareness, powerful lead-generating tools, and a world-class support team, the CENTURY 21 System is dedicated to helping you succeed. It's our company mission to enable CENTURY 21 affiliated sales associates to provide best-in-class brokerage services to all who aspire to buy and sell real estate anywhere in the world. Success in accomplishing our mission is exemplified by the fact that the CENTURY 21 brand again swept all four customer satisfaction segments in the J.D. Power 2016 Home Buyer/Seller Satisfaction Study – a repeat of our 2014 and 2015 performance. Specifically, the CENTURY 21 brand ranked highest among national real estate companies across all four customer satisfaction segments in the study, including: First-Time Home-Buyer Satisfaction, Repeat Home-Buyer Satisfaction (Tied in 2016), First-Time Home-Seller Satisfaction and Repeat Home-Seller Satisfaction. By choosing to be part of the CENTURY 21 System, you'll be joining a team of over 6,900 franchised broker offices with over 100,000 sales associates and a presence in over 78 countries. Those numbers help to make us the most powerful and recognizable name in real estate. 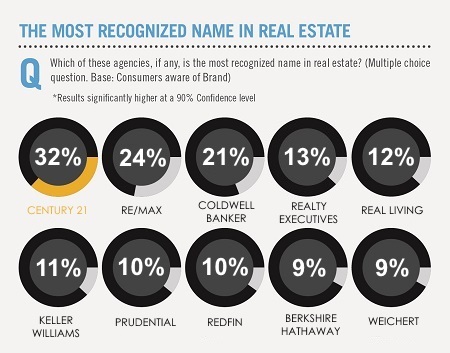 In fact, among consumers presented with a list of other real estate brands, the CENTURY 21 brand was identified as having "the most recognized name in real estate," according to a 2015 Millward Brown customer survey. But what does a name mean to you? Well let's use our website as an example. Over 92% of homebuyers use the web in their search. According to Comscore data, CENTURY21.COM was the #1 "most visited" real estate franchise website, attracting more unique visitors than any other real estate franchise brand site in 2013 and 2014. Promote yourself with our world-class marketing. Our bold new commercials have placed CENTURY 21® affiliated agents front and center during iconic television events such as the 2012 and 2013 Super Bowl, the 2013 Indianapolis 500, the 2013 and 2014 Little League World Series, the 2012 Summer Olympics, the 2014 Winter Olympics, the 2013 US Open, and the 2014 World Cup. The CENTURY 21 System has a longstanding sponsorship with U.S. Soccer as well as recent sponsorships with IndyCar and the USA Bobsled/Skeleton teams. From the asphalt of the Indy 500 in the #21 Sarah Fisher Hartman Racing IndyCar to the fields and tracks of the World Cup and Winter Olympics, our sponsorships reflect our brand's desire to be Faster than any other real estate franchise. Our aggressive listing strategy displays your listings on over 500 real estate search websites. It's our goal to get your listings in front of as many buyers as possible. The result? We help provide you with lots of leads and deep savings on enhanced listing opportunities on sites like Zillow, Trulia, and realtor.com. Exclusive technologies like our Android phone, Android tablet, iPad and iPhone apps help users view, gather, and share information about C21® listings. The CENTURY 21 brand gets more people talking about you. CENTURY 21 uses Facebook, YouTube, Twitter, Flickr, LinkedIn, Pinterest and our blog @C21 Home Matters, to help you connect with the world, and help potential customers to connect with you. With the CENTURY 21® System you'll experience a wealth of Innovative Tools to help you grow your business. Put national CENTURY 21 print, online, radio, and television advertising to work for you at a local level with our Ad Maker program. You'll be able to customize our advertising with your contact information saving you valuable time and marketing dollars. You are provided access to one of the most comprehensive performance-based learning platforms in the industry. 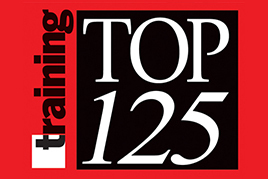 In fact, we're a Nine-Time Training Magazine Top 125 Award winner. Take advantage of our live and on-line courses as well as partnerships with industry leaders, trainers, and coaches. Smarter. Bolder. Faster.TM It's more than just a tagline. We realize the important role that learning and business development plays in the long-term success of brokers and agents affiliated with the CENTURY 21 System. That's why the CENTURY 21 System is proud to be one of Training Magazine's Top 125 Organizations for Exemplary Learning Solutions for 8 of the last 10 years. As a franchisee you'll have access to CENTURY 21 University, one of the most comprehensive education and training platforms in the industry. In addition to the great tools and resources available to Agents, we offer a wealth of free and tuition based courses to help Brokers and Managers succeed. International Management Academy (IMA) — a five-day business-focused program designed to give you the tools and know-how to build and maintain a world-class real estate company. Management Certification Program — focusing on leadership, agent engagement, and company growth. Office Learning In A Box — an online kit for brokers and managers to aid them in delivering compelling, in-office learning sessions to their affiliated Agents. The kit includes: an instructor guide, handouts, videos, and discussion points. Brian Buffini - Exclusive Access — in addition to Peak Producers, you'll also receive valuable discounts towards Brian Buffini's live Success Tour events (including an in-office, live-streaming option). The CENTURY 21® System is accepting franchise applications in key markets for individuals that are interested in setting a new standard of service, quality, and commitment. If you would like to explore affiliating with the System, please complete the form to the right.